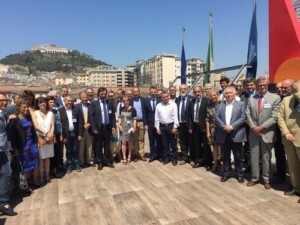 During its General Assembly in Naples, the Intermediterranean Commission of the CPMR received the prestigious Mediterranean Award for Institutions from the Fondazione Mediterraneo. Peripheral and maritime regions in the Mediterranean have outlined their key political priorities, including the need for a coordinated strategy to deal with the deepening migration crisis, the importance of a reformed Europe built on solidarity and cohesion, and the necessity for multilevel Mediterranean cooperation. The priorities were presented by Mediterranean member regions at the Annual General Assembly of the Intermediterranean Commission (IMC) of the Conference of Peripheral Maritime Regions (CPMR), held in Naples, Italy, on 6-7 July. A political declaration was released addressing all the main challenges and including specific recommendations. 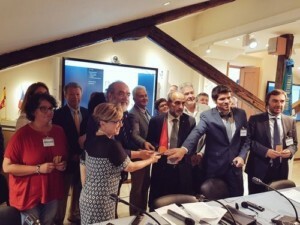 As well as politicians from the IMC’s regions, the high-profile meeting also brought together representatives from the European Commission’s Directorate General for Maritime Affairs and Fisheries (DG Mare), the Union for the Mediterranean, EU Mediterranean cooperation programmes, and networks of universities and local authorities. 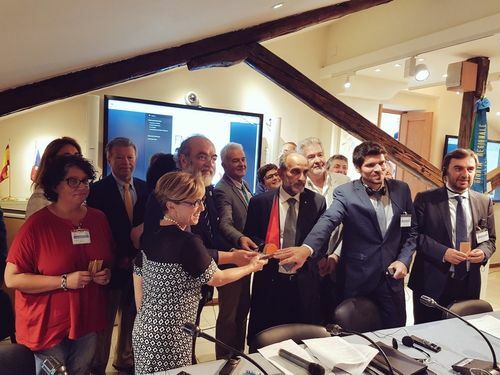 Furthermore, during the meeting the Intermediterranean Commission (IMC) was presented with a renowned Mediterranean award by the Fondazione Mediterraneo, for its work supporting cohesion and regional development in the Mediterranean. Regarding the migration crisis, the Intermediterranean Commission (IMC) and its member regions are calling for the EU and international communities to develop a long-term strategy to more effectively deal with the mounting pressures being faced by Europe’s Southern neighbourhood. This strategy must include the proper involvement of Mediterranean regions in EU decision making, giving them adequate assistance and resources to face the challenges of reception and integration of migrants. Regarding the future of the European Union, CPMR Secretary General, Eleni Marianou, stated that: “The complex challenges facing Europe have contributed to uncertainty, and the Brexit negotiations will have different levels of impact across Europe, including in the Mediterranean. I am happy that the IMC regions support the CPMR’s central vision of a reformed Europe built on strengthened territorial, social and economic cohesion; reinforced cooperation and partnership inside and outside its borders; and a Europe based on shared values with solidarity at its core”. In support of this positon, the IMC member regions are calling for a reinforced and reinvigorated EU post-2020 Cohesion Policy. The future Cohesion Policy should cover all regions, addressing the growing social, economic, environmental and territorial disparities, and counterbalancing the negative impacts of the Single Market. It shall also foresee a single set of rules for all European Structural and Investment (ESI) Funds. The IMC recognises that Mediterranean regions are greatly affected by youth unemployment and by the social integration issues that result from it. Serena Angioli, Regional Minister of Campania, and host of the meeting, said “Over 40% of young people are unemployed in the Mediterranean regions of Greece, Spain and Italy, we must create concrete job opportunities for youg people, and boost education and mobility, which is essential for growth in the Mediterranean territories. The EU should strengthen the support to our actions”. Regarding cooperation, the IMC regions have also given their support to emerging initiatives and strategies that can strengthen Mediterranean cooperation and multilevel governance, such as the West Med Initiative the EUSAIR and BLUEMED Initiative, along with the long list of Mediterranean cooperation projects where they are actively involved. In terms of Maritime Affairs, the IMC regions stress the need to promote the Blue Economy in the Mediterranean together with the UfM, while ensuring the protection of the environment. On climate, environment, and energy, they have reaffirmed the will of Mediterranean regions to contribute to the Paris Climate Agreement, to promote more effective water management systems, and to develop innovative energy renovations in buildings. Finally, in relation to Transport and Accessibility, the IMC regions urge the European Commission and its Member States to accelerate the implementation of the infrastructures located on the Connecting Europe Facility (CEF) corridors affecting the Mediterranean, and the development of connections between them and the Motorways of the Sea (MoS).